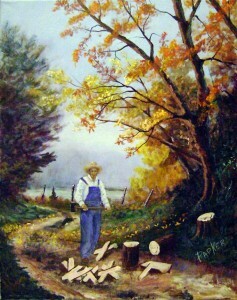 One day a woodcutter took his grandson into the forest for his first experience in selecting and cutting oak trees. These they would later sell to the boat builders. As they walked along, the woodcutter explained that the purpose of each tree is contained in its natural shape: some are straight for planks, some have the proper curves for the ribs of a boat, and some are tall for masts. The woodcutter told his grandson that by paying attention to the details of each tree, and with experience in recognizing these characteristics, someday he too might become the woodcutter of the forest. A little way into the forest, the grandson saw an old oak tree that had never been cut. The boy asked his grandfather if he could cut it down because it was useless for boat building – there were no straight limbs, the trunk was, short and gnarled, and the curves were going the wrong way. “We could cut it down for firewood,” the grandson said. “At least then it will be of some use to us.” The woodcutter replied that for now they should be about their work cutting the proper trees for the boat builders; maybe later they could return to the old oak tree. except for firewood, that now allows us to rest against its trunk amidst the coolness of its shade.